The SaleCalulator program allows you to input quantity of items sold, unit price, discount rate, and tax rate. Then the program calculates and outputs the subtotal, discount amount, taxable amount, tax amount, and total of sales. 1 include Scanner class to the program. 2 open the SaleCalculator class block. 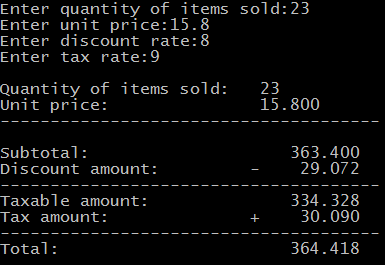 4 declare local variable qty to store quantity of items sold. 5 declare the local variable unitPrice to store the unit price of the product. 6 declare the local variable subtotal to store the sales subtotal. 7 declare the local variable discountRate to store the discount rate of sales. 8 declare the local variable discountAmount to store the mount of sales discount. 9 declare the local variable taxRate to store the tax rate of sales. 10 declare the local variable taxableAmount to store the discounted total. 11 declare the local variable taxAmount to store the amount to tax. 12 declare the local variable total to store the total of sales. 13 create Scanner object sc. 14-21 get quantity, unit price, discount rate, and tax rate input by the user. 24 calculate taxable amount or discounted total. 27 print a new line. 28-36 display quantity of items sold, unit price, subtotal, discount amount, taxable amount, tax amount, and total of sales on the screen. 37 close the main method. 38 close the SaleCalculator class. Everyone is responsible for his business and that’s the reason that every person who thinks about to invest money in any firm or business, so he must think about the calculation of his investment, and he always looking for the best tool for calculate his investment, according to me the best tool for calculating your invest is the Investment Calculator which is very reliable and fast tool for every type of calculation.